The Sweet Partner in Crime had a conference to attend in Seattle recently. After our wonderful time last year in Vancouver, we decided to pop over to Vancouver Island for a few days prior to the SPinC’s work responsibilities. If you’re thinking, “Hey…if you were just in Vancouver – why go back?” – the city of Vancouver, BC, is not on Vancouver Island. It’s a ferry or floatplane ride away. What *is* on Vancouver Island (VI) is British Columbia’s beautiful capital city, Victoria, and some wine regions that you should learn about if you don’t think climate change is a hoax perpetrated by the Chinese. Additionally, the island is well known for slow food/farm-to-table cuisine. “Fresh from the Island” signs dot the storefronts and restaurants using local ingredients abound. Many of the wineries double as neighborhood lunch spots, where you can swap stories with the locals over sandwiches, fresh fruit, and glasses of rosé. We set down home base in Brentwood Bay, about half an hour north of Victoria. Brentwood Bay is in Central Saanich. The Saanich wineries are tucked back here and there among some pretty rural roads up and down the peninsula. 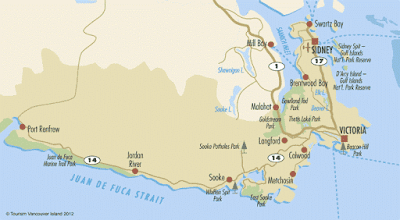 A short ferry ride from Brentwood Bay to Mill Bay (which, conveniently, loaded just steps from our hotel room), lands in the Cowichan Valley, which follows the Trans-Canadian Highway down to and along the southern coast of the island. We quickly discovered something interesting – the wineries we explored on the island fall roughly into two camps: all-estate and kinda-estate. Most of the wineries grow at least some of their grapes on site. Many, however, supplement their harvest with grapes and juice from other regions of British Columbia – largely the Okanagan Valley, which produces 80% of all BC wine. The winemakers who do “all-estate” wines – boy howdy, are they ever rightfully proud of that fact – are creating some pretty righteous juice from the workable varietals. Many varietals, like Cabernet Sauvignon or Syrah, simply won’t grow there. But the ones that do – pinot noir and pinot blanc, especially – develop uniquely crisp, clean characteristics. The whites tend to end up fruity and floral and the reds, especially the pinots, have superb balance for lighter bodied wines. I’ve long said that winemakers need to focus on terroir before tourism. Sure, people are more familiar with Chardonnay then Ortega or Gewurztraminer – but if the latter make better wines in your climate, plant ‘em! The best, best thing about the estate wines – at least for right now? They’re inexpensive. Most of these wineries’ high end offerings topped out at about $25-30 Canadian, which with the current exchange rate puts a high quality pinot noir in your happy hands for about twenty bucks. And most of these wineries are in beautifully scenic locations, so getting there is half the fun – although a car is necessary. Cherry Point – “I try to turn the land into art,” said Javier, who with his wife Maria, came to British Columbia from Columbia and Ecuador. After a number of successful business ventures, including landscaping and restaurants in the city of Vancouver, the two of them decided to buy a vineyard on VI. They make a series of wines of quality. Our favorites were the floral, grapefruit-and-green appley Pinot Blanc; a tropical fruit flavored riot in their Ortega; a light-styled pinot noir; and a blend of Agria and Zweigelt (Hungarian and Austrian varietals) called “Bete Noire” that was full-flavored without being heavy. The winery also does an annual paella-fest, where Javier shows off the recipe that has earned him multiple medals in competition. Venturi-Schulze – After our taster, Gary, dealt with a gaggle of Snapchatting bachelorettes, we were treated to their interesting spread of estate grapes: a sparkling Zweigelt, an aromatic white called Siegerrebe, a light, peachy blend of Ortega and Schönburger called “Primavera,” and a beautifully delicate-yet-spicy pinot noir. The wines were good, but they weren’t the star of the show. The vinegar was. Creek’s vintner. If his product is any indication, I wouldn’t argue too much with him. Their 2012 Pinot was one of the highlights of the trip –beautiful, cool fruits are deep and smoky without being extracted, and ridiculously underpriced at $22. Seriously, it had no business being that good for that price. They also make a lovely, delicate rosé and a red from Marichal Foch that reminded me of Beaujolais. Andy said that while he “goes where the terroir takes him,” he does have a couple of tricks up his sleeve. He experimented with wrapping the perimeter a block of grapes with cling wrap to give a little bit of extra insulation at the start of the season. He thought it worked so well that he’s considering doing it to his entire vineyard next spring. She poured us a rosé of pinot, which we both really enjoyed, as it was made in a very Provence-style, and a light-styled Pinot Noir. She also let us try a tank sample of their 2015 Pinot, which looks to be a real winner. I’d also recommend a tour and tasting at Victoria Distillers in Sidney, where they crank out small batches of spirits of various types. My favorite was their gin, which was done in a more botanical style than the typical London Dry. Apples grow plentifully throughout British Columbia, so there are a number of cider houses scattered across the peninsula. We stopped for a tasting at Sea Cider, where we sampled a flight of six ciders, a couple of eaus-de-vie, and a “cider slushie” while enjoying a beautiful view of Mount Baker. Our favorites were the “Bittersweet,” “Rumrummer” and “Pippins.” Thumbs up. And finally, no column about this area would be complete without at least one mention of the spectacular eye-candy that is Butchart Gardens. Look it up and gaze in wonder. We had dinner in their restaurant, which lived up to its many recommendations. For anyone who likes playing in the dirt, this experience should be on your bucket list.